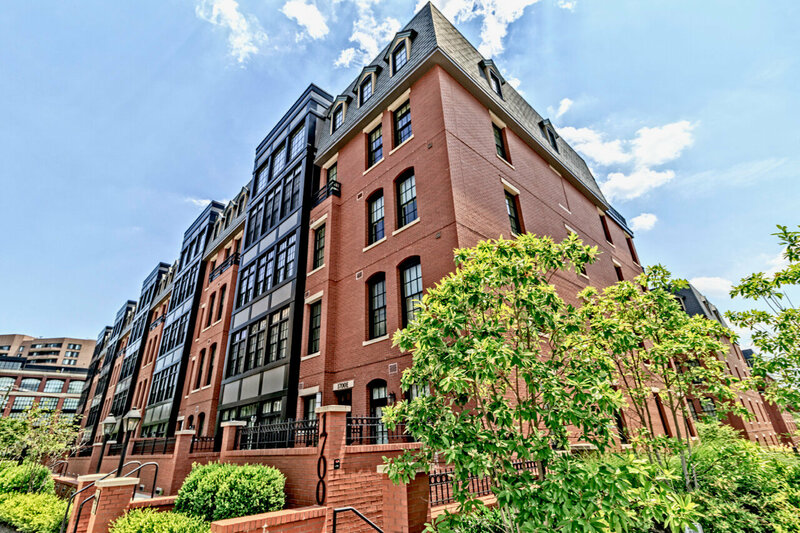 One of the newest and swankiest condominium communities in Arlington, Virginia is Gaslight Square. A product of Abdo Development, the project was delivered in 2012 and takes up a full city block along the red-hot Rosslyn-Ballston Corridor. With three stylish five-story buildings, Gaslight Square offers 84 upscale residences in a variety of styles and floorplans. 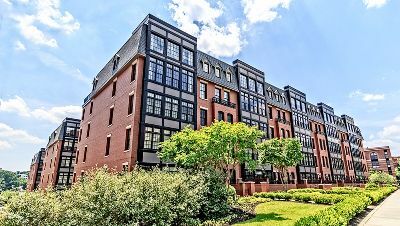 The complex’s façade offers staggered red brick and black steel sections, combining to present an interesting combination of both retro and contemporary row house flavor. Plus, the location is prime territory, in trendy Rosslyn and just east of the lively Courthouse neighborhood. And yes, there are actually gaslight lampposts for that added throwback touch, right in front of the buildings on Clarendon Boulevard. There are three types of luxury condos for sale at Gaslight Square—flats, lofts and penthouses. Within those groupings are six different floorplans ranging from 1,158 to 1,882 square feet in size. Not only are the one and two-bedroom residences unusually spacious, they have ceilings that are at least 10 feet tall, but that soar as high as 19 feet. Plus, there’s some type of private outdoor space for each and every unit: large garden patios for ground level models, dining balconies for the flats and amazing rooftop terraces for the penthouses. Upper level units are reachable by direct access elevators, and all of the delightful urban homes boast hardwood floors and open space concepts. The great room living areas flow seamlessly into minimalist modern gourmet kitchens with white granite counters, white custom cabs, hanging pendant lights and Wolfe-SubZero stainless steel appliance packages. This award-winning community at 1700 Clarendon Boulevard was built with sustainable green features, including EnergyStar appliances and other environmentally efficient usages. Residents enjoy secure parking and are also equal distances from the Rosslyn Metro Station to the east and the Courthouse Metro to the west. And then there’s all the other great community amenities in the immediate area. Those include a Whole Foods Market, restaurants like CIRCA at Clarendon, Lyon Hall and The Liberty Tavern, the Bistro 360 Wine Bar, Market and Restaurant and the the always popular Ray’s Hell Burger for those sinful late night greasy cravings. 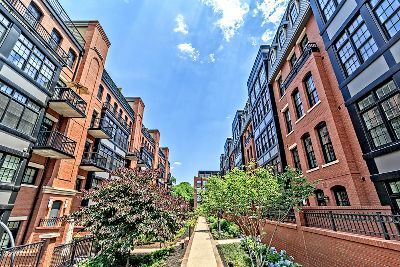 For more info on Gaslight Square, call us today at 202-798-3600!